Fluid retention, also called water retention or edema, occurs when your body retains too much water due to some hormonal imbalance, nutritional deficiency or disease process. Fluid retention looks similar to tissue swelling caused by injury, but it typically does not involve tissue damage, inflammatory reactions or pain. Fish oil displays antioxidant and anti-inflammatory properties, and may help combat inflammation from injuries, but it doesn't have diuretic properties. If you notice fluid accumulating in your feet, hands or abdomen, consult with your doctor and try to understand the underlying cause before taking any dietary supplements. Furthermore, ask your doctor about the potential benefits and side effects of consuming fish oil. Fluid retention is a type of swelling caused by an accumulation of abnormally large amounts of fluid in the spaces between your body's cells or in the circulatory system, according to the University of Maryland Medical Center. It most commonly occurs in the lower legs, especially the feet and ankles, although it also affects the face and hands. Fluid retention is a symptom of some imbalance or condition in your body; it's not classified as a disease or disorder. Fluid retention is relatively common in pregnancy and old age, although it affects people of any age and both genders. Fluid retention is caused by a variety of factors, including hormonal changes, electrolyte or salt imbalance, high blood pressure, lack of dietary protein, negative reactions to medications, blocked lymph vessels, damaged blood vessels, allergic reactions, standing or sitting in the same position for too long and diseases involving your kidneys, heart, liver, or thyroid, according to the "Textbook for Functional Medicine." Although fluid retention occasionally involves pain or discomfort, depending on the underlying cause, it typically does not involve an immune or inflammatory response. In contrast, inflammation is often defined as swelling due to tissue injury or infection. Fish oil is a product from fatty fish, particularly salmon, herring, mackerel and tuna. Fish oils are usually rich in omega-3 fatty acids known as eicosapentaenoic acid, or EPA, and docosahexaenoic acid, or DHA. Omega-3 fatty acids are precursors of substances called eicosanoids, which help to reduce and prevent inflammation throughout the body, according to the "Textbook of Nutritional Medicine." As such, supplementing with fish oil capsules may be helpful for combating inflammation resulting from an injury or chronic disease. On the other hand, edema or fluid retention doesn't usually involve an inflammatory reaction, so fish oil may be of limited use in preventing fluid from pooling around your body. Certain compounds known as diuretics help reduce fluid retention by increasing the rate of urination. 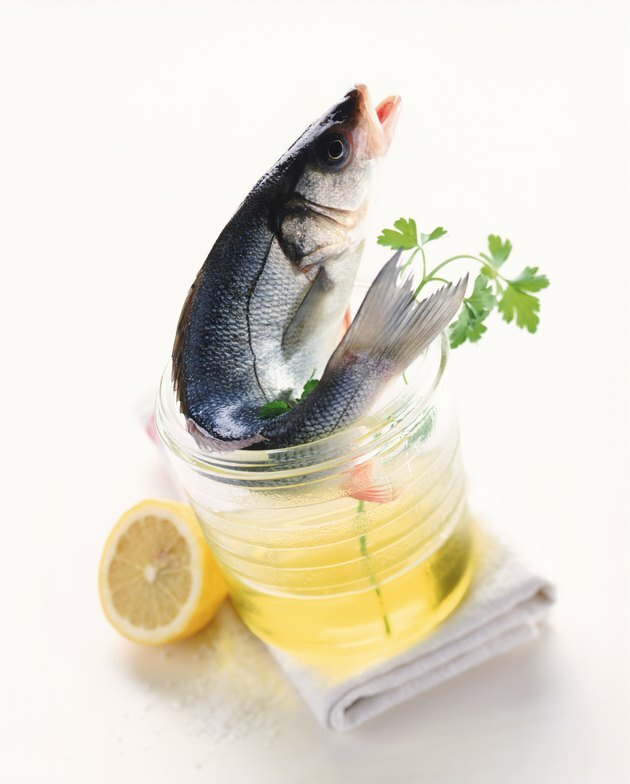 Fish oil is not considered a diuretic, but certain herbal remedies and medicines are. Your doctor may recommend diuretic medications, although essential minerals and vitamins are often depleted with excessive urination. Other natural methods of reducing edema include a low-salt diet, daily exercise, massage and wearing support hose. Can Low Potassium Cause Swelling in the Feet?